One of the least expensive landscaping materials you can use at your home is gravel. It is easier to transport and move than larger rocks or stones. You can find it at many landscaping resource businesses, including purchasing it from a quarry. It can be removed as easily as it is put down, requiring no special tools or glues, and it has many uses. Gravel can be as small as a pea or much larger. Gravel can be used for driveway creation purposes regardless of size. It can be crushed and used in a concrete mixture, providing some traction to the drive. And it can be laid as it is, regardless of size, onto a wide swath of your property as a loose drive material. The many colors available in this drive paving substance (white, beige, brown, gray) provide ample variety choices when it comes to matching the drive with your home and landscaping colors. You can put gravel in the bottom of flower pots to create a drainage foundation for flowers. Line the bottom of raised or in-the-ground flower beds with gravel for drainage needs. Line a downward sloped gully with gravel to make a more attractive drainage route for runoff water from hill areas on your property and to help direct water flow instead of allowing it to seep into soil areas that easily become saturated due to heavy rains. Shore up areas in the landscape at risk for soil erosion with gravel. Place beneath or around house drain pipes to prevent soil erosion in this location. Spread at the bottom of hills on your property as well as areas such as embankments. Gravel can be used to make a flower garden border, used as filler on a path around large stepping stones, or as a pea or other gravel-sized walkway path between your home and your flower garden. 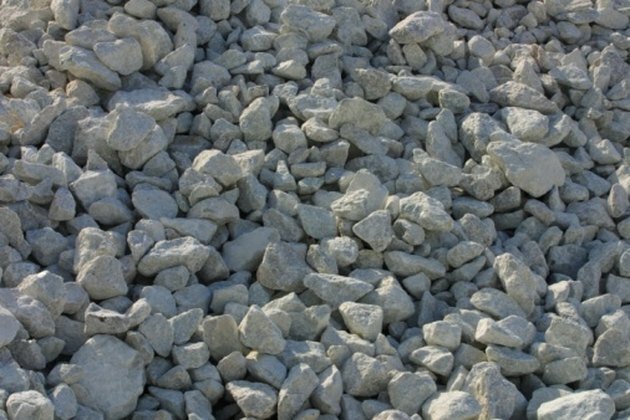 With various sizes of gravel and colors available it can serve many uses in the landscape, also including as a background for a rock garden containing boulders and other types and sizes of rocks. Before you purchase gravel you will need to know how much you need for the area to be landscaped, and that means you need three dimensional measurements before you can do that.